We live in a world where businesses are starting to have data in two different places in the cloud and on premise. Having data in the cloud with Office 365 is brilliant as it allows for more employees to be mobile and for them to access data and files from anywhere and on any device. Then we have that legacy data that exists on premise, which businesses still rely on as many of their key systems are still on these systems and we can create these hybrid environments where we get the best of both worlds. But building apps that span across these two worlds can be difficult,we may need specialist skills to write an application that can grab data from these different sources. We can’t host applications directly on Office 365, so we need to find a way of hosting the application and getting Office 365 to access it. 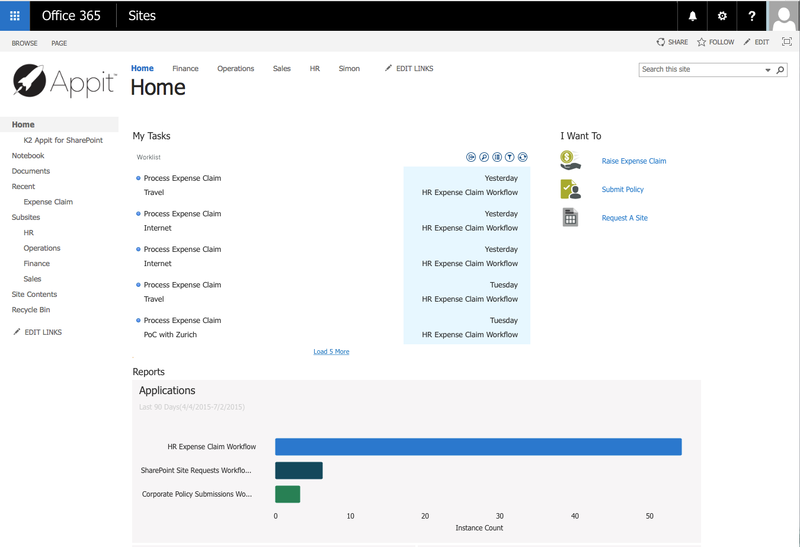 There is no central task list where can get tasks that span across multiple different Sharepoint sites and collection. There is no audit trail that gives a complete break down of what is happening and in real time. Bringing in data from multiple different sources can be very tricky. Deploying these applications between environments is often difficult. Well what we need is something like Lego, where we can have building blocks of different sizes that can easily fit together with out any specialist skills or tools, like you would if you had a Meccano set. I hated Mecanno sets they were always so fiddly to build anything, and it sometimes involved forcing the pieces together which might mean slighly bending them to fit together. Where as lego was simple, you could build what ever you wanted from very simple models to very complex all made up from different sets and common components. There are other tools out there allow you to make simple apps in Office 365 like Microsoft Access, the short lived FoSL and the zombie app InfoPath which died and then was brought back to life and there are many more out there on the market. But they all only take you 90% of the way and more importantly we are still doing that Meccano thing where we have to make customisations to get them to work properly. What we want is a platform that will allow you to build an application that doesn’t need specialist skills and it has components that can be dragged and dropped. Where can access data from anywhere whether it is in the cloud or on premise. The application can be accessed anywhere and on any device. With no need to build different forms and we can have components that are completely reusable and the apps come with a complete audit trail of everything that has happened and last of all a task list that shows all your tasks where ever you are. With K2 Appit you can build forms and workflow in the cloud for Office 365 without the need to write a single line of code. It doesn’t matter if you have a new subscription to office 365 or an existing one or your SharePoint 2013 is hosted on premise. Appit works across all these and in combination of each other with no loss of functionality. Watch the video below to see what an end user would experience with using an app created in Appit. So what does a App look like, well we start off with a landing page that shows you information that is important to you. 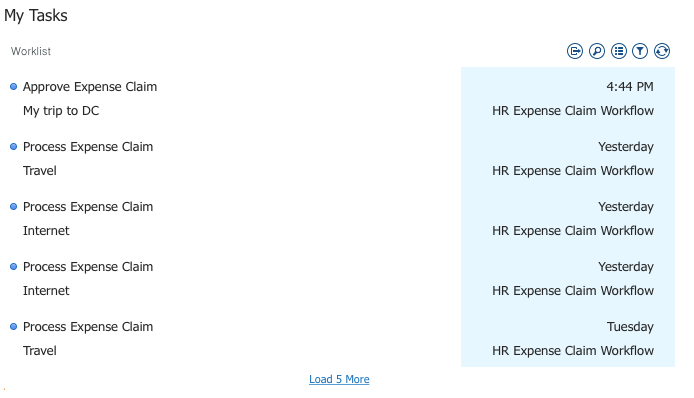 A central task list that will show all your tasks where ever you are.So it doesn’t matter if you have some tasks on Office 365 and some on SharePoint 2013. All those tasks can be accessed in a central place and also on a dedicated app that you can download from your device store. The task list can easily be filtered so you can easily find what you are looking for and you can even activate out of office and automatically redirect all or certain tasks to someone. There is also out of the box reporting that can show you the number of instances that are currently running and what stages they are at and who has been involved with those. This is really handy as it allows decision makers to see what work is currently being done and how long it it is taking, but it also allows them to see any bottle necks where additional resources may needed. Appit allows us to replace those out of the box SharePoint forms with a rich responsive form that can not only be accessed from within SharePoint but also outside of SharePoint and because they are responsive no additional forms are needed for mobile devices. So it’s one form for multiple devices. All done done using drag and drop technology with no code involved. There is also a workflow designer that allows you to build very simple to complex workflows that can span across multiple sharepoint collections and again it’s all drag and drop and no code. Appit allows us to automate manual tasks like sending an email or SMS message to updating a business system with the correct information and it does this all at the right time. Smartforms are web based forms that are built using drag and drop technology so there is no code involved. They are also responsive so there is no need to build different forms for different platforms and they are reusable so you can use the same form for different applications. They also contain reusable components called ‘Views’ which can also be reused in different smartforms. The workflow designer is web based and workflows are designed using drag and drop technology, so again there is no code involved. 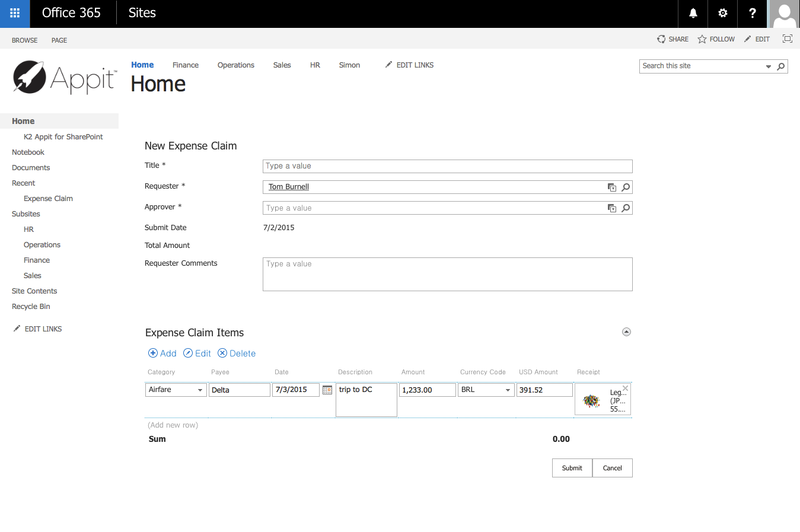 It allows you to build very simple workflows to very complex workflows that can span across different sharepoint sites whether they are in the cloud or on premise. The workflow designer takes the manual tasks like sending an email or updating a key business system with the correct data and does it for you. The forms and workflow would be useless with out this building block and is probably most important one of all. K2 Appit can talk to these data sources Azure SQL,SQL,Dynamics CRM,SharePoint (online,on premise),Web Service. Once these smartobjects have been created it’s just then drag drop again and the designer building an app doesn’t need to know how to write a sql statement or navigate CRM etc..
How cool is that? I love Smartobjects they are just so powerful and if you are a developer like me it allows you to bring code easily into your no code apps. Once you have these building blocks you can then starting building and building and reusing components to build apps quicker. So we have seen a end user demo of a K2 Appit app and we have looked at what makes up a app. Now lets see how easy it is to build something. I am going to split this into 2 demos, the first one is building a workflow app that moves one document from one library to another and the 2nd demo will be replacing those out of the box SharePoint forms with K2 Appit Smartforms. Sounds awesome doesn’t it? Lets take a look. This demo is using K2 Appit Workflow engine to move a document from the draft library to the approved library in Office 365 once it has been approved by the approver. How awesome was that, we can even have the draft document attached to an email for offline working and then the approver can reply back to the email with their decision. The task it self comes with the document attached and any additional data so there is no need to go to that document library to find the correct document. So that was a basic workflow Appit app now lets see how easy it is to build a form with K2 Appit. So the feedback Form App will get store it’s information in a SharePoint List, but it will also go and get some additional data from Dynamics CRM and show this data on the same form. That looked really easy and quick to use didn’t? You can see how these reusable building blocks come into play. You just drag the view on the form and set a simple rule and it’s done. You have a form that is data rich and responsive. You can probably guess that if you want to build Apps like we build models with Lego then Appit is really the only way to go. 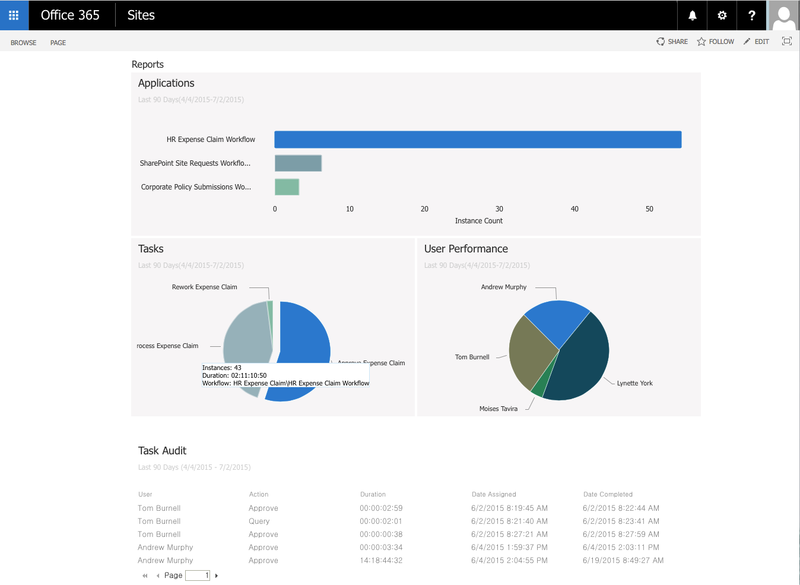 As it provides both the builder and the user a rich user interface all in the context of SharePoint/Office 365 and more importantly for the designer’s point of view there is no code and it’s completely reusable so it allows for very rapid app development for building apps on Office 365.